I have a one year old Collie who as a puppy had a lot of commercial puppy food reactions which included vomiting and hair loss on her ears. She could not eat any commercial dog treats without vomiting. I started making all her treats homemade and she did great! I was still concerned feeding her store bought food wondering what I was really feeding my "girl". I started making all her food homemade for each day and she flourished. She has never had any vomiting since and her hair is so pretty. I make up all my own dog food recipes for her "dinners" and am working on a cookbook. She eats ground beef, ground turkey & chicken as her main meat entrees. She does not care for fish. She eats tons of vegetable including green beans, corn, mixed vegetables, peas, etc. She eats potatoes....sweet and white. She eats a lot of pasta and rice. I make casseroles, mini meatloaf & turkey loaves, Hamburger specials. She eats some eggs and loves cheese. I have a ton of recipes I have created that work well for her. 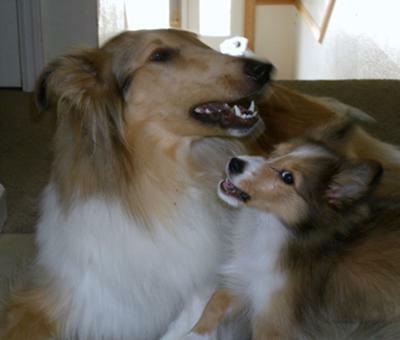 I now have a five month old Shetland Sheepdog that began vomiting her commercial puppy food as well. She now eats everything my Collie does but is still supplemented with Lamb & Rice puppy food and does still vomit it once in a while. I will convert her to home cooked dog food as well as soon as she is an adult. They both love all the meals I make and they both look and act fabulous! They especially love a liver treat I bake them. Neither one of them have ever reacted or had an adverse reaction to any homemade food or treat I make. I know what works for some dogs may not work for other dogs but I am happy with both my "girls" outcome. Their veterinarian always comments on how healthy they both are and that my adult Collie has the healthiest teeth he has ever seen. My dog groomer has commented on my Collie's teeth as well. Healthy food, healthy treats & dental bones are my only contributions to both their health and beauty! I would be glad to share recipes with anyone interested but do not give any guarantee as I said what works for some dogs may not others but I am VERY happy and so are BOTH my "girls"!!!! Hi just wanted to say I love the story and was wondering if you would share some recipes. I have a Saint Bernard and he gets bored of his food and I think any person would if they ate chicken and rice everyday for their entire life. I just think he would like some other meals to go with what he already has. Would you share your dog food recipes please ? I have two small female dogs, mother and child. The mother was found in the street, and they do not like commercial food. I tried to mix a good breed, like Acana, with chicken and rice, but it´s hard work because they only choose everything but the commercial breed ! So I´m thinking of making all home food, will you share your recipes with me, please ? I made my own dog food after our 2 babies ate tainted dog food which left our one boy with badly damaged kidneys. I did want to mention that millet is wonderful in the food. It is easy to make and so good for dogs and people. I had a hard time to keep the rest of the family from eating the dog food! I could not believe how soft our dogs' coats became with the homemade dog food. I'm positive our dogs were much healthier.